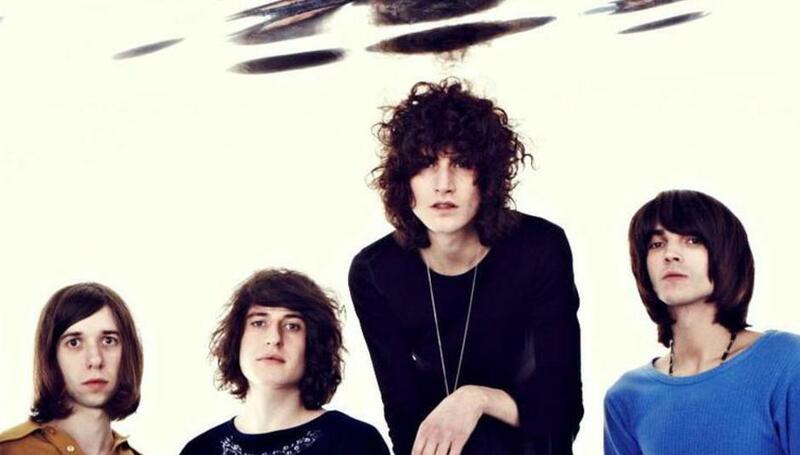 Temples are one of the hottest new bands around at the minute. Endorsed by the likes of Brett Anderson who recently invited them on tour with Suede and cited by both Johnny Marr and Noel Gallagher as the best new band in Britain, it's been a memorable twelve months for a band that barely existed this time last year. They're also possibly the most exciting thing ever to come out of Kettering, the Northamptonshire town they call home. Signed to Heavenly Records last summer on the back of a demo featuring November's debut release 'Shelter Song'. This evening, the four-piece; James Bagshaw (guitar & vocals), Tom Warmsley (bass), Adam Smith (keyboards) and Sam Toms (drums); find themselves opening for Suede at Nottingham's Rock City. Next month they'll be doing the same for The Vaccines arena tour before taking in every corner of the festival circuit including The Rolling Stones' Hyde Park extravaganza in July. DiS: When did you form the band? Tom Warmsley: The end of last summer really. That's when it all started. At first it was just a recording project between me and James. We had some ideas about what we wanted to do, and then we put four songs on You Tube. But at that time it really was nothing more than a recording project. And then we got such a positive response from the songs we put online we decided to form a band. After Adam and Sam joined, we spent a lot of time rehearsing so we could play them live. And Adam and Sam are both from Kettering as well, so they were perfect people to form a band with. DiS: What influenced you to make music with such a distinctly classic psychedelic sound? Is that what you were listening to at the time, or was it something you'd grown up with and always intended to pursue musically? Tom Warmsley: We started off where everybody starts from. We're big fans of pop music, The Beatles and the Stones, all that kind of stuff. Then as our tastes matured, we brought in other influences. We'd heard lots of bands do certain things in certain ways, and I guess our intention was to try and take a bit from each and create something of our own. James Bagshaw: I think also, fans of music; which we are; tend to be fans of producers as well. People that create things sonically like Jack Nitzsche. People that everyone talks about because they deserve that acclaim for being prolific in their field. When we uploaded the songs originally it was our choice to not only make a statement with the songs, but also with the sound too. They were all done at home in my bedroom. We were searching for the right sound that the songs desired and deserved, because I think any song can be totally different depending on the way it's produced. And then it comes across in a completely different way, so I think once we achieved that sound with those four songs it gave us a thread and made us realise exactly what we want. Instead of going in with a producer who would have stamped his own sound on the songs we created a sound of our own. DiS: Debut single 'Shelter Song' was also the first song you wrote together. Critically, the response has been phenomenal from almost every publication both in print and online. Looking back, did the success of 'Shelter Song' give you the impetus to continue writing songs in a similar vein? James Bagshaw: I think it did in a way. We never expected the response to be so wild! Tom Warmsley: I think in as much as we knew what we wanted to do, nothing was calculated either with regards to 'Shelter Song'. We just stumbled across a drum sound that we liked, and then I recorded some bass on it. It wasn't so much an accident but everything happened really naturally. When we played it back we were surprised how well it all worked, and from that I guess we did develop a formula in terms of what to do and what not to do in the future. DiS: On the flipside, do you ever worry whether or not the press will turn and give you a bad review at some point? Tom Warmsley: If people don't like it that's fine. At least they've listened to it in the first place and acknowledged it. So long as we're judged on our merits rather than being tarred with the same brush as other psychedelic bands or whatever. DiS: You come from Kettering, which I guess has a small town mentality in many ways. Does that influence the way you write in any way? Tom Warmsley: It's kind of the opposite in a way. If you live in a city it's easy to be inspired by everything that goes on there. At the same time, seclusion and withdrawal from somewhere can be just as inspiring in its own way. That's what led us to record lots and lots, and also gave us the opportunity to figure out what works and what doesn't. James Bagshaw: We didn't really think that much about coming from a small town. You are more likely to be influenced when there's no one there to influence you. You're kind of out there alone. There's obviously pubs and clubs in Kettering but in terms of a scene, there isn't one. It used to have a refined scene where all the bands knew each other. Now there aren't any other bands left it gave us more of an impetus to do exactly what we wanted. Tom Warmsley: It's literally our record collections that influenced us rather than where we had a drink on Saturday night or something. DiS: I guess that can make it easier to develop an individual identity in a sense as there's no one else to compete with? Tom Warmsley: Definitely, yeah. It forces you to think outside the box. Because there's not much going on you do what you want. It's hard to talk about really. James Bagshaw: We love our town though! Let's make that clear. Tom Warmsley: Even when we were away at University in London and Nottingham we've always had our fingers on the pulse with what's going on. It's not like we haven't heard any other music outside of our hometown. DiS: Have you played any shows in your hometown to date? Tom Warmsley: We played a show at the Labour Club in Northampton which is just down the road from Kettering. I think that's the only local show we've done so far. James Bagshaw: We keep getting asked to do shows in Kettering but there really isn't anywhere to play. Tom Warmsley: If there was we'd play there every week. James Bagshaw: Our first show was at last year's Green Man Festival. Tom Warmsley: That was quite strange! DiS: Was it quite surreal that Heavenly wanted to sign you before you'd actually played live together? Tom Warmsley: Jeff Barrett who runs the label heard 'Shelter Song' online and signed us almost immediately. They got us completely and have been really helpful, being there from the beginning and watching us grow as a band. They heard our first collection of songs and saw what we were trying to do. James Bagshaw: They completely understand our ethos. Jeff comes from a similar background in that he's very rootsy and just listens to the music with his eyes closed. It is very surreal though because we've grown up listening to pretty much every act they've ever released. DiS: Do you see any kind of affinity between yourselves and some of the bands they've worked with both past (Manic Street Preachers, Saint Etienne, The Rockingbirds) and present (Toy, Stealing Sheep)? Tom Warmsley: Definitely. They've always done their own thing and that's what we're trying to do. If putting some songs up on the internet can generate interest like that it speaks volumes as to how records should be created and sold. Artists don't need to sell themselves via expensive marketing campaigns. The music always comes first. DiS: Would you ever consider signing to another label at some stage? A major for example? James Bagshaw: No, I don't see why we would. With Heavenly we've stumbled across something perfect really. You don't necessarily need to be on a major label these days. All that bravado cheapens your music. Tom Warmsley: It's not that we're into slagging off major labels. I know there are some really good people that work for majors but what we have with Jeff and Heavenly is really special. Why change it? DiS: When are you planning to release a follow-up to 'Shelter Song'? Is there a timescale as to when you see yourselves putting out an album even? Tom Warmsley: We are looking to release a single in the next couple of months. It's a new song called 'Colours To Life'. James Bagshaw: There are no demos of it online or anywhere, it's literally the most recent song we've written. Tom Warmsley: We are writing all the time, so we've already got an album's worth of material but no projected timescale as to when it's likely to come out. We just want to keep on writing and see what we can do. It's also important we find the right person to work with as well. The main characteristic of our sound is that we have a huge hand in it. DiS: Do you have a wishlist of producers you'd like to work with? James Bagshaw: Ourselves! I think just go along as you mean to go on. As Tom said, we do like the idea of working with someone else. We never want to close doors as there could be someone out there who'd make our songs sound even better. Sometimes it takes another pair of ears to guide it over the finishing line. I'd like to think we'll always produce our own material in terms of creating the sounds and then arrange it. The way it ends up being mixed can make a difference as well to be honest. Tom Warmsley It would be great to do something with Sonic Boom. That would be incredible. DiS: How do you feel about being associated with the new psychedelia or "psych" scene as it's come to be known? Tom Warmsley: I think it's great. That scene revolves heavily around live performance. There seems to be a resurgence for bands wanting to be involved with that, and I think the sounds lend themselves to it really well. James Bagshaw: I don't see it as a negative thing. Ultimately it's just somebody's opinion. There are psychedelic elements to our sound and we love that kind of music. When I think of psychedelia I think of music that's spacey or makes a sonic impact, and I think they're both integral parts of our sound. It's meant to be aurally exciting but we have actual songs there as well. Tom Warmsley: I think the main thing from our point of view is to not make people see us as a sixties pastiche. That's why we're always writing and trying out new ideas. It's important for us to be able to keep everything fresh. DiS: You're supporting Suede at the moment, then off with The Vaccines next month and The Rolling Stones at Hyde Park in July. Is it daunting playing to so many people, particularly when most of them won't have heard any of your songs before? James Bagshaw: It is daunting but also really exciting. When you write music it's designed to be played live and if you get the chance to play to more people that's great. Tom Warmsley: The fidelity you get from playing bigger stages in bigger venues is brilliant but we all prefer smaller shows where everyone is packed in like sardines. If you could combine the two, play in a small room with a really large sound system it would be perfect. DiS: Your music has also received glowing endorsements from the likes of Johnny Marr and Noel Gallagher, the latter citing you as "the best new band in Britain." How does that make you feel? Tom Warmsley: Wow! I mean, it's great that they like it but there are lots of good bands around at the moment. DiS: Which bands would you recommend? James Bagshaw: Splashh are really good. We played with them recently. Their live sound is incredible, really washy. Tom Warmsley: Melody's Echo Chamber, Toy, Tame Impala, Jacco Gardner, Wolf People... There is a psych scene, you're right! DiS: You're also scheduled to play numerous festivals throughout the summer. Are there any you're particularly looking forward to? James Bagshaw: Hop Farm. We're playing on the Friday which is the same day as My Bloody Valentine and The Horrors. We want to stay for the Saturday as well because Rodriguez is playing but we've got a gig so I don't know if we can just cancel it! Tom Warmsley: Secret Garden Party should be fun. I don't actually know who's playing apart from us but that isn't important! James Bagshaw: It's also quite local to us as well, just a stones throw away. For further dates and information on the band, visit their official Facebook page.